MilkPrice: What Does Brexit Mean for U.S. Dairy Prices? What Does Brexit Mean for U.S. Dairy Prices? On Thursday, June 23, the United Kingdom voted to exit the EU. The vote to exit was not expected and since Thursday, the news and speculation on the impact have monopolized news reporting. So far, there has been no mention of the impact on something as specific as U.S. dairy pricing. For those whose lives depend on U.S. dairy pricing, this post will review the possible impact of Brexit on U.S. dairy pricing. How can this event possibly impact dairy pricing? Well, there is good reason to expect an unfavorable impact. As has been reviewed many times in this blog, the U.S. dairy business, which was once very locally based, has now evolved to national and then to international exposure. U.S exports and imports of dairy products fluctuate and significantly influence dairy inventories and thereby influence pricing. Dairy is an international business and subject to all international events. Reviewing the prior posts on imports and exports of dairy products, one can see that imports of dairy products to the U.S. come primarily from the EU and New Zealand. In turn, they play an important role in U.S. inventories and pricing. There is currently too much supply and too little demand for dairy products worldwide. When there is too much supply, all suppliers must match declining prices to get international business. Because currencies from different countries vary in terms of exchange rates, exchange rate fluctuations can competitively influence international pricing. A strong USD makes U.S. dairy products more expensive in the international markets. 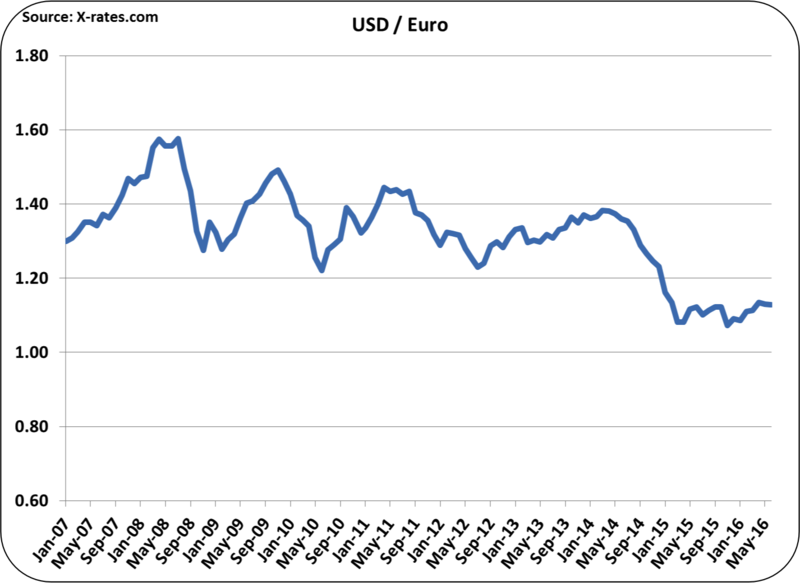 With the exit of the U.K. from the EU, there is concern about the Euro currency. While there is much speculation and uncertainty about Britain's exiting the EU, there are a few facts that are fairly certain. Obviously personal entry into the U.K. will be more difficult. This alone should not influence U.S. dairy prices. However, the entry of food products into the U.K. may also be more difficult. There will also be less financial support from the U.K. for the EU. These factors could have a significant impact. Weakening of the EU trade with the U.K. and a weakening of the Euro can have an impact of U.S. dairy pricing. Currently, the EU has a surplus of dairy products caused by the Russian embargo against imports and the dropping of European quotas to control excessive production. This has caused a surplus of butter, cheese, NDM, and other products in the EU. If exports from the EU to the U.K. become more complicated and therefore decline, more excess will be available in international markets. 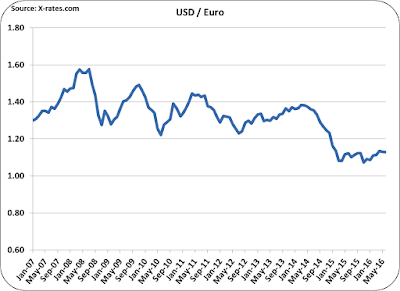 Exchange rates between the Euro and USD have stabilized in 2016 and there was hope that a strengthening of the Euro would cause a reversal of the ten year trends shown below. A weaker Euro makes EU dairy products more competitive internationally, causing U.S. dairy prices to fall to compete with the EU prices. At least in the short run, U.K.'s exit from the EU will cause a weakening of the Euro. The U.K. always retained the pound as there currency, so that is no change, but their departure from the EU will be a negative for the Euro. If the U.K. exit does adversely impact the EU economy (and this is likely), the current recessionary mode, could cause a reduction in EU consumption of dairy products. That would also put more dairy supply into the international markets, further reducing international dairy prices. While most of the above is fact based, there is also an emotional impact from this change in global economics. When there is change, and this is a major change, people and companies typically enter a "conservative" mode to control the uncertainly and this is not good for growth. Change creates uncertainly and decisions linger in times of uncertainly. This could also impact U.S. dairy prices adversely. The EU exit by the U.K. could open the lid and other countries may consider exiting. It is too early to predict how this might play out, but it would surely impact the strength of the Euro and other trade agreements. There is a possibility of one major event that could counter some of the negative possibilities mentioned above. There is decent chance that Russian embargo may be lifted in 2016. This would increase export demand for EU dairy products and take product off the international market. For more details on how U.S. imports and exports influence U.S. dairy prices, read the recent article in Progressive Dairyman by this author. It does detail the change of events that can influence domestic U.S. dairy pricing. Different products are influenced in different ways. As always, these events will be followed in future posts to this blog. ...... There is a possibility of one major event that could counter some of the negative possibilities mentioned above. There is decent chance that Russian embargo may be lifted in 2016. This would increase export demand for EU dairy products and take product off the international market. VERY UNLIKELY, information from the Russian front, is that the Embargo will continue well into late 2017.